Module 1 Introduction Learn how to develop an effective digital strategy for your organization and gain clear insight into the complexities of planning, strategic management and reporting. Module 2 Traditional Communications The Traditional Communications module looks at communications before digital marketing became widespread and how it has evolved over the years. Module 3 Digital Communications The Digital Communications module will teach you about the digital communications approach to audience engagement. Module 4 Digital Channels This module will introduce you to the value, characteristics and suitability of social media platforms and contextualize the digital landscape, including Search Marketing (SEO), Email Marketing, Digital Display Advertising, Mobile Marketing, and Social Media Marketing. Module 5 Social Customer Service The Social Customer Service module looks at using social media as a customer service channel, peer-topeer communities and how what is happening online is critically important to businesses. Module 6 Budget & Resourcing The Budget & Resourcing module looks at the crucial aspects of planning and maintaining a budget in your digital marketing strategy. Module 7 Big Data & Analytics The Big Data & Analytics module will provide you with a broad understanding of Big Data, Advanced Analytics and Artificial Intelligence. Module 8 Digital Leadership The Digital Leadership module will guide you as you transition from a traditional to a digital strategy and empower you to mentor and lead your team in their digital marketing activities. Module 9 Strategy Formulation & Plan The Strategy Formulation and Plan module will provide a structured conclusion to bring together all the strands of the Digital Strategy and Planning Program. Being able to define clear targets to maximize the ROI of our digital marketing efforts was my main objective for returning to study. Do I need to have a marketing background? Who should take this course?How much will the course cost? Where will my qualification be recognized? How is the program assessed? Anyone can apply for the Professional Diploma in Strategy and Planning. A background in a related discipline is not required – the aim of the Professional Diploma is to allow you to learn everything you need to know about strategy and planning within a broader digital marketing spectrum; and to kickstart a new and exciting career. You may be a business owner looking to take your online marketing to the next level or you may be someone looking for a change of career. The only prerequisite is that you have in an interest in a digital marketing career. This program is aimed at anyone involved with planning a digital strategy for their organisation, or who is likely to be involved in this area in the future and would like a comprehensive understanding of the field. This certification is suitable for any level of skills or experience and is designed to prepare you to engage specifically with strategy and planning within an overall digital marketing domain. 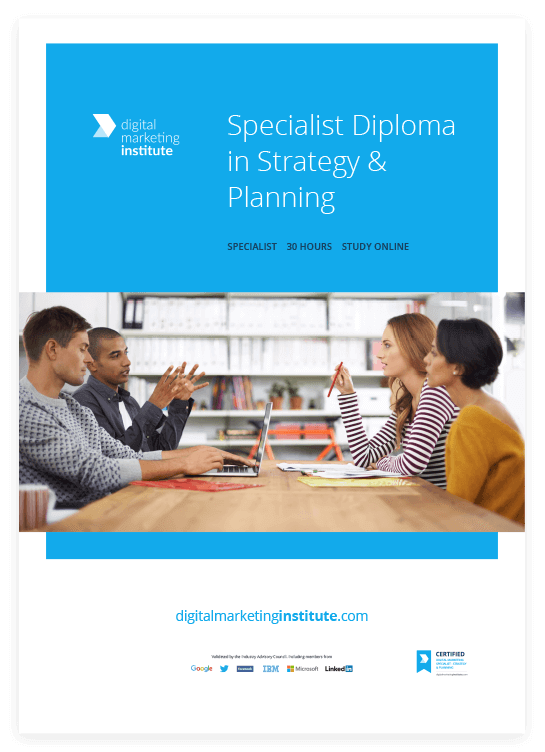 The Professional Diploma in Digital Strategy and Planning costs to study online. This includes all course content, membership and the examination fee (first attempt only). The Professional Diploma in Digital Strategy and Planning is assessed by one three hour exam; these are administered by our computer-based testing partner, Pearson Vue, via its global network of test centers. Candidates need to achieve a minimum of 60% to pass the exam. Your examination fee is included in the course price but subsequent re-sits due to failed attempts will incur a fee of approximately €60 or local currency equivalent payable directly to the Pearson Vue when you book your repeat attempt.